It may seem odd to start with a picture of the end of a job but without the freely given help of our regular Thursday volunteers the end would be a bit away yet. On the Buttermere side of the property we have Jim ( and Theo) Phil and David, who when he promises to behave is often joined by his much much better half Christine, Borrowdale rangers Andy and Jack are supported by Rod and Robert. One day a week may not sound a lot to some people but when we get this team together on a busy project a truly astonishing amount of work, and fun results.On this occasion rangers Dan and Paul were in the last throes of a large hedge laying project at Dunthwaite on what turned out to be a very wet and boggy site. 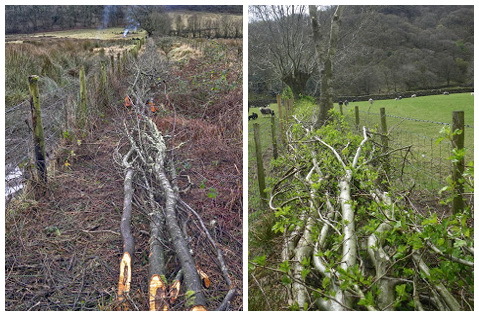 Hedgelaying is a country craft which has been practised for hundreds of years, Caesar described the process of hedgelaying in detail in 57BC in his Gallic War when he encountered laid hedges in the territory of the Nervii in Flanders, but it is just as relevant today as it always has been. As a hedge grows it becomes more tree like and gaps appear,laying the hedge restores this living boundary and provides an effective wildlife corridor allowing small animals and birds a route from field to field unseen by predators. 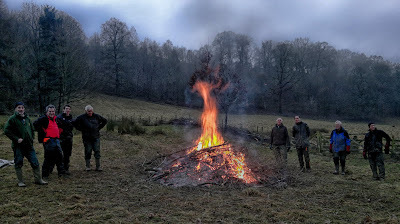 The downside is that it produces a lot of 'brash' unwanted trees and branches which are removed as part of the process, our preferred method of dealing with this would be to use a mechanical chipper but the wet and boggy conditions prevented this so we reverted to the traditional method, a damn good fire.... or in this case two! Now, you can almost guarantee that if you gather a group of men of a certain age in a field they will all know the 'correct' way to light a fire, some favour diesel and tyres, some like firelighters and some just stick to paper and dry kindling, everyone is correct of course with the proviso that my method is always best, this time we used bags of old jackdaw nests, removed from a barn some months ago and kept for this very purpose.. Forward planning in the NT??? What ever next! We have mentioned the wet and boggy conditions, what we failed to mention was the steepness of the site, as the morning progressed it became evident that the fire at the bottom of the hill was much more popular but after what seemed a rather extended lunch break everyone gathered at the much larger and beautifully constructed fire at the top. I was doubtful that we would clear the field that day but this is were our merry band excels, driven by an unwillingness to admit defeat and I suppose the enjoyment of showing us 'young'uns' how it's done, they pulled ,dragged pushed and stumbled until they had gathered every piece of brash from the site, a slow trudge down the field dragging bags of firewood and they were off for a well earned pint, no doubt looking forward to the next Thursday's task........................more hedgelaying and burning!!!!!!!! January is a time when we tend to think about how we're spending our time, and how we'd like to be spending it better. If your new year's resolution was to spend a bit more time outdoors in this beautiful area, and maybe to help make a difference to a charity and to give something back, we might have an opportunity for you. We're really excited about a new project that's just starting up. Over the next twelve months we'll be taking a pop-up visitor information tent to popular locations in the Borrowdale and Buttermere valleys and use it to talk to visitors. We want to find out more about what they're doing on their day out and to gather feedback about how we could make their visitor experience better. So if you like finding out what makes people tick, you want to spend some time outside two of the most beautiful valleys in the Lake District, and you want to be part of a one-year project that will help shape the future direction of how we engage with visitors to the two valleys, why not contact us for an informal chat over a cuppa to find out more? 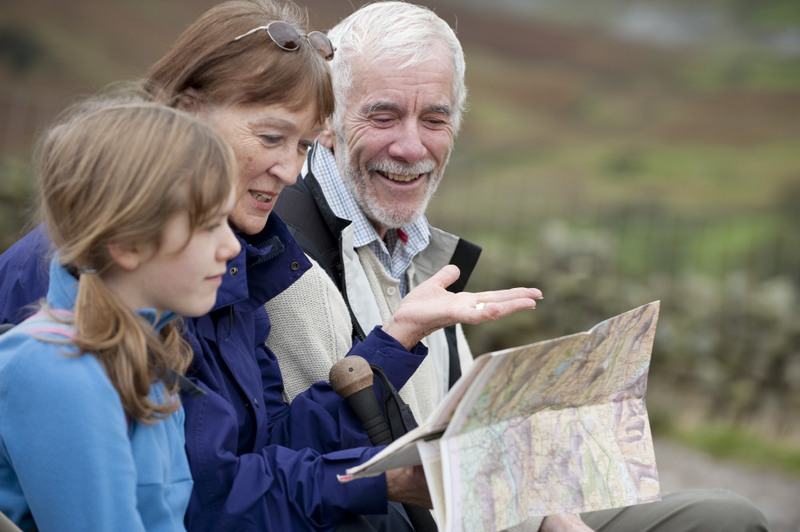 You can read more information here on the volunteering pages of the National Trust website, email northlakes@nationaltrust.org.uk contact us via Twitter @NTNorthLakes or telephone on 017687 74649 to speak to a real live human being!